← Why use one number, when seven 3D graphs will do? Perhaps the most potent weapon in the graphing arsenal is the contour. Our eye and brain are designed to appreciate edges between light and dark, or lines that mark a border. We instantly appreciate the connectedness of points along a contour, and we also appreciate the shape of the contour, and its trajectory. This is why it is so easy to display trends by plotting a collection of points and connecting them with a contour. But like any powerful weapon, it can be misused. For example, by displaying a contour where there are no data! 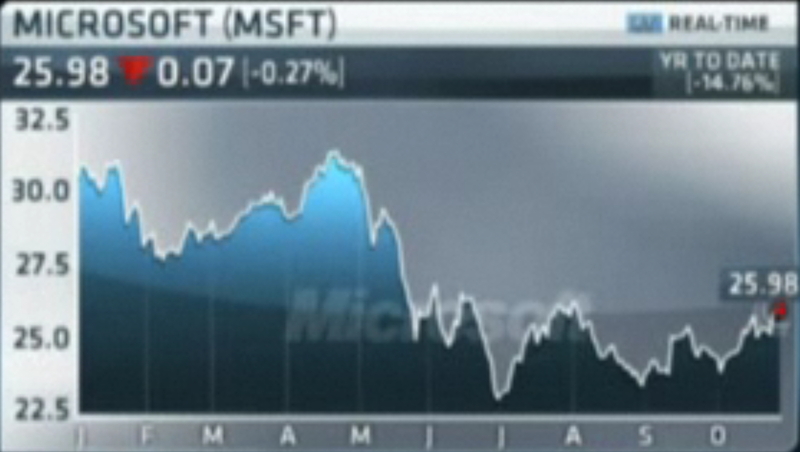 This seems pretty obvious, but it has escaped the chart designers at CNBC-TV. For those of you unfamiliar with this outlet, it is the leading cable business news channel worldwide. To their credit, they rely heavily on graphs. I recently clocked a random one-minute segment and counted six graphs. Most of their charts, naturally enough, show trends over time in financial data such as stock prices and corporate earnings. 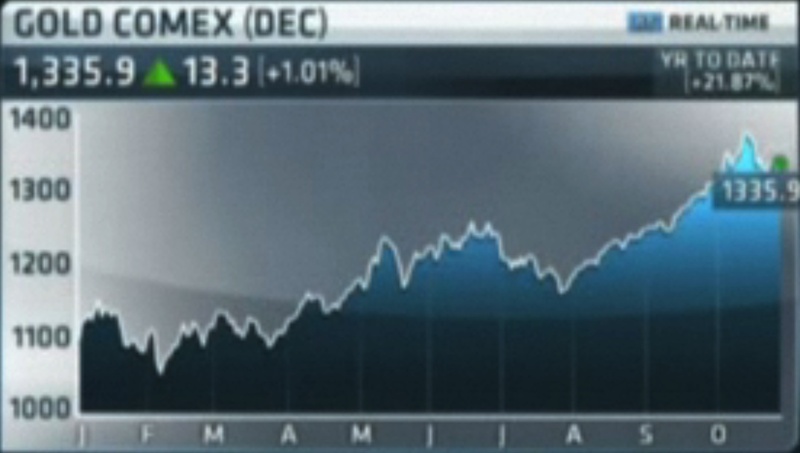 Here is a chart from a recent edition of “The Call,” a morning business program on CNBC-TV. In many respects it is an unremarkable, even commendable graph. But wait: what is that curious smile-shaped shadow that extends across the entire graph? Is it some theoretical curve? Some baseline curve against which to compare the lofty performance of gold? Perhaps a projection of some sort? Of course, what we are looking at is an egregious example of what is politely called “decoration,” and less politely called “background crap.” Background crap is always bad, because it masks the visibility of the important information. In this case, the background is particularly pernicious because the trend of the pointless contour competes with the trend of the contour we should be perceiving: the trend of the data. Indeed one wonders whether a more nefarious scheme is involved. Perhaps the chart designers are not clueless, but devious, and actually trying to bias our perception. Note that the curve declines (so sad…) but then recovers (yes!) Perhaps this smile is just that: a smiley face, meant to lift our spirits whatever the trajectory of the actual investment considered. All will be well; things go down, but then they come back up. Smile, and the world smiles with you. This is consistent with the generic optimism about all things financial that is part of the CNBC-TV culture. More likely, a “graphic designer” was called upon to juice up the visual appeal of the graphs on the show. What was really needed here was a “graph designer.” But that job, however essential in our data-driven world, has yet to be invented. Lesson: Don’t put meaningless contours in the background of your graph.